The Asian Canadian Writers' Workshop is extremely pleased to be partnering with the Treasure Green Tea Company as a distribution point for Ricepaper Magazine. An institution in Vancouver's Chinatown for many years, the Treasure Green Tea Company offers traditional and rare Chinese tea in which its products are gathered from various parts of Asia as each product is distinctive and unique. Chinese tea stems back from many dynasties ago as it became popular in giving people a rejuvenating and refreshing sense of well-being. Today, and on a daily basis, people from all around the world still enjoy the nutritious benefits of drinking Chinese tea. Treasure Green Tea Company has a wide range selections of Organic Teas, including various Green Tea, Pu-erh Tea, Jasmine Tea, White Tea, Oolong Tea and Black Tea, etc. 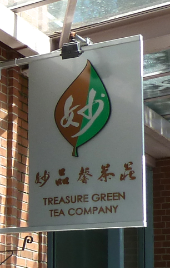 Treasure Green Tea Company just celebrated its 30th Anniversary 1981-2011. So feel free to visit Treasure Green Tea Company and pick up the latest copy of Ricepaper Magazine.